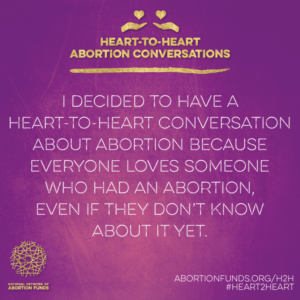 Heart-to-Heart Abortion Conversations is more than a campaign… It’s a card deck, toolkit, and a process YOU can shape. You are invited to change culture and shift stigma around the topic of abortion through powerful, values-based conversations. 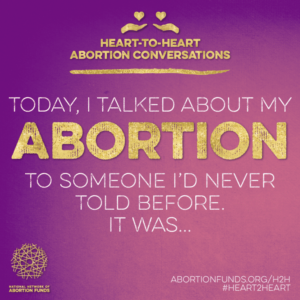 When you participate, you will discover more about what values and thoughts shape your own opinions about abortion access while also listening deeply to the thoughts and feelings others. Use the news to start a conversation. With so many attacks on access to reproductive healthcare, you have an opportunity to start a conversation when responding to the outrage people feel when they read or watch the news. Starting a Heart-to-Heart conversation is a great place to let them know they can do something about it! Pick people that you want to grow in your relationship with. This could be someone who you think is with you, but you haven’t formally invited them to an abortion fund event in the past. Or it could be someone you never said the word “abortion” to before, and that’s a starting point to build on. Get your #Heart2Heart hashtags going. Promoting conversations on your own Facebook page, Instagram, Twitter will help peak the interest amongst your friends. 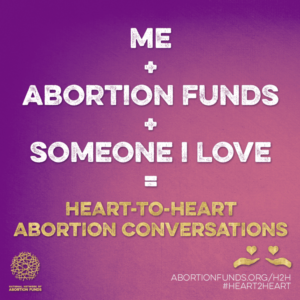 Use a fun, shareable image (below) to help spread the word if you have pledged to have Heart-to-Heart Conversations. Then tell us about how it went! 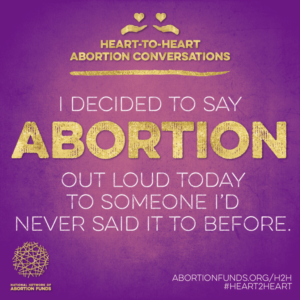 Share the story of your conversation with #Heart2Heart. Learn more about sharing and supporting others in our toolkit. Dialogue, storytelling, and intentional conversations are powerful tools to organizing and strengthening our movement. 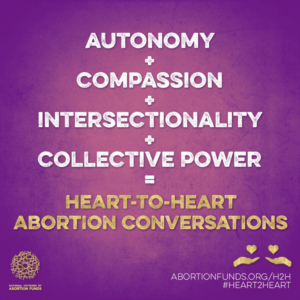 Heart-to-Heart Abortion Conversations are designed serve as a catalyst to grow your leadership, deepen connections, and make abortion access a reality. 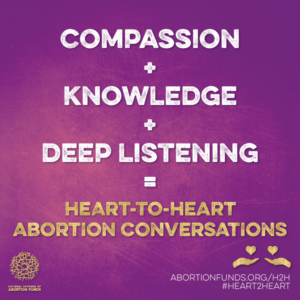 By tapping into love and empathy, speaking from our values, and seeking to understand and really hear others, we will be able to connect and build relationships, even when we don’t agree on everything about abortion. Click and Share on Social Media!